My name is Julie and I'm a venture capitalist with no capital. :) Which means...I understand if you're an entrepreneur with no business. 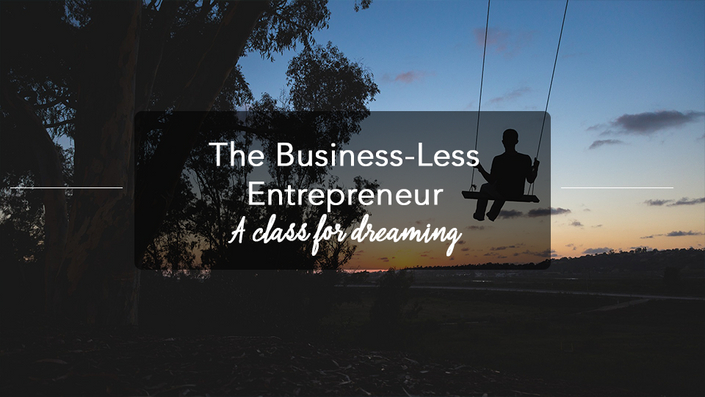 This course is meant to satisfy the craving for a business, before one exists yet. I must say, not all of you will come out the other side with one. But many of you will. And I would LOVE to help you get there. The class meets four times - LIVE. It begins on May 5th at 2:30pm EST and lasts for 45 minutes. The replays will be uploaded to the school. Upon signing up, you will access to an introductory lecture that includes a workshop replay about finding business ideas in an existing blog, an idea worksheet, and an assignment to generate some ideas. VERY IMPORTANT! I want you to come to class with a few ideas. So be sure to do the intro activities! Generating a plan that doesn't strangle you before you start! Lesson #4: Crunchy Crunching Numbers and...Getting Started? Taking all those ideas and putting them in concrete numbers so you can actually try!